"At around 7 o'clock this morning, the encapsulated Advanced Earth Observing Satellite (ALOS) left the Spacecraft and Fairing Assembly Building 2 (SFA2). The size of the satellite cover, the fairing, is about 12 meters in height and 5.1 meters in diameter. The encapsulated ALOS was then transported at walking speed to the Vehicle Assembly Building (VAB), where launch vehicle operations are underway, and arrived at the VAB at around 8:00 a.m. All operators wore hard hats and fireproof suits because the ALOS has already been loaded with propellant. 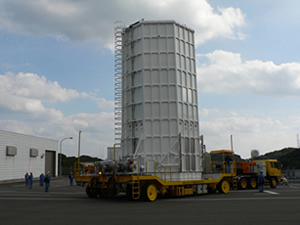 The ALOS arrived at Nishino-omote Port in Tanegashima on May 18 (Wed), 2005, and was transported to the Spacecraft Test and Assembly Building 2 at the Tanegashima Space Center at dawn on the 19th for assembly and inspection. On Dec. 12 (Mon), it was moved to the SFA2 for propellant loading and a final check, then encapsulated with the fairing on Jan. 5, 2006. After being transported to the VAB, the encapsulated satellite was slung, and, by noon, it was tentatively loaded on top of the second stage of the launch vehicle, thus the launch vehicle is now in a complete shape with all parts assembled. The satellite and launch vehicle mating operations will be henceforth finalized, a duct for air-conditioned air and other parts will be installed, and a further inspection will be carried out. The H-IIA F8 launch site operations are now in the final phase." January 6, 2006: What is the H-IIA F8? "The H-IIA F8 is a two-staged H-IIA 2022 standard type launch vehicle with two solid rocket boosters (SRB-A) and two solid strap-on boosters (SSB). It is about 58 m in height and 320 tons in mass (without a payload). 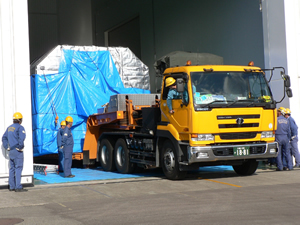 The Advanced Land Observing Satellite (ALOS), the payload of the H-IIA F8, is about 4 tons. It is quite a heavy passenger for the H-IIA. Therefore, to increase the launch power, two SSBs are additionally installed to the standard type 202, by which the 3.7 ton Midori-II (ADEOS-II) was launched in December 2002 (H-IIA F4). The ALOS is encapsulated by a payload cover called a "fairing" and placed on top of the launch vehicle. There are some variations of the fairing, and this time, the 5S type with a diameter of 5 m and a height of 12 m is used for the ALOS. The fairing plays an important role in protecting the payload from the harsh launch environment such as air resistance and heating. The launch vehicle is now waiting for the actual launch in the Vehicle Assembly Building (VAB) at the TNSC, while the ALOS is sitting in a separate building, the Spacecraft and Fairing Assembly Building. On the 5th, the ALOS encapsulation was completed. The encapsulated ALOS will be transported to the VAB early next week to be loaded on top of the H-IIA by being slung. Then, both of them will wait for the moment of liftoff in the same building." January 11, 2006: Where is the heart of the H-IIA F8? "There are two engines in an H-IIA, the LE-7A engine for the first stage and the LE-5B engine for the second stage. Both of them are liquid propellant engines that generate thrust by using liquid oxygen and liquid hydrogen. The engine consists of a "combustion chamber" where energy is produced by burning propellants and a "nozzle" which looks like a trumpet for generating thrust from the generated energy. For the H-IIA F8, a "long nozzle" which has been developed to improve launch capability has been adopted for the LE-7A. It is about 50 cm longer than a conventional nozzle. With the long nozzle, the engine performance improves so that a heavier and larger satellite can be launched. This is the first flight with the long nozzle. Therefore, the H-IIA F8 has another important mission to acquire data during the flight to incorporate it into future launch vehicle development. In other words, this launch is the first step for us to further evolve the H-IIA into the H-IIB." January 12, 2006: What is the Advanced Land Observing Satellite? "The Satellite has been nicknamed "Daichi" (meaning "Land"). 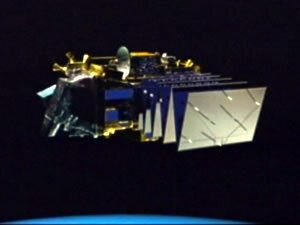 The ALOS is one of the largest earth observing satellites, and its mass is about 4 tons. The altitude of its orbit will be about 700 km, and that is equivalent to the distance from Tokyo to Hiroshima or to Hakodate. It is a polar orbit which passes over the North and South Poles, and the satellite travels one round of the earth in 99 minutes (that is to say 14 to 15 rounds per day.) The satellite can cover the whole earth’s surface in 46 days or 671 rounds. For your reference, a metrological satellite that you may be more familiar with travels 36,000 km in altitude over the equator. The longest part of the ALOS is the solar array paddle, which is three meters in width and 22 meters in length. 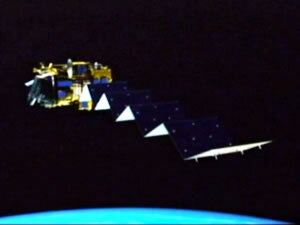 In orbit, the paddle converts sunlight to energy to provide necessary power to the satellite. When being launched, the ALOS will be encapsulated in the fairing whose dimension is 5.1 meters in diameter and 12 meters in height. Therefore, the paddle has to be stowed by being folded into nine segments. About five minutes after the separation from the launch vehicle, the holding bolts that fix the paddle to the satellite during the flight will be released, then the nine segments will be deployed by using spring force. When the attitude of the satellite is stabilized, the paddle will start tracking the sun. The solar array paddle has the characteristic that its power generation performance is significantly decreased when the shadow of the satellite’s main body casts over it. In the case of the ALOS’s orbit, sunlight comes only from the left side of its traveling direction. That is why the ALOS has the solar array paddle only on the left side facing the moving direction. The satellite was loaded onto the launch vehicle the day before yesterday, and now the paddle is waiting for the moment to expand and fly into space." "The launch of the H-IIA Launch Vehicle No. 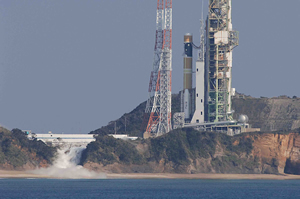 8 (H-IIA F8) with the Advanced Land Observing Satellite Daichi (ALOS) onboard has been postponed due to a malfunction found yesterday in a part of the launch vehicle onboard equipment(*1) during the Y-1 operations(*2). We will replace the malfunctioned part with a new one. The new launch date will be announced as soon as it is determined." January 13: What we can see from the ALOS? "The ALOS has three sensors (or eyes). The PRISM can distinguish a 2.5-meter object on the ground, and take a three-dimensional photo of it. How can the PRISM capture the three-dimensional photo, including side-view images of an object, when the satellite looks down at earth from space? Three-dimensional photos cannot be taken with a camera if we snap images in a conventional way. The PRISM is equipped with three cameras, and each of them looks at the front side, top, and rear of an object respectively." "Today’s weather at the TNSC is cloudy with some occasional sunshine, but showers are forecast for the evening. The temperature is 17 degrees Celsius, which is relatively high for this time of year and has been this way since a few days ago. As the launch approaches, many members of the "Launch Organization" that has been specially organized for launch operations are gathering at the TNSC. The Center is now in a tense mood. Today, "Y-2 countdown" operations are underway at the TNSC. When you hear the word, "countdown", the actual counting down of numbers, "4, 3, 2, 1, liftoff" should immediately come to your mind. In the case of the H-IIA launch, the moment of the liftoff is called "X-time" or "X-0", and the launch day is "Y" or "Y-0". All operations are scheduled based on these two zeros. Now, some of you may wonder why today, the 16th, is "Y-2" not "Y-3". The scheduled "X-time" is at 10:33 a.m. on the 19th (Japan Standard Time, JST), thus "Y-0" starts on the 18th, or the "Y-0" is on both the 18th and the 19th. Therefore, today is "Y-2." You may also wonder how the so-called "countdown" is carried out. An automatic computer controlled system is used that starts 60 minutes prior to liftoff. The countdown used to be read out aloud by young JAXA employees, but the automatic system was introduced for the launch of the H-IIA F1. In addition to the voice countdown, a digital time display called the "X-0 time display" helps our operations. The displays are located in major buildings such as in the Control Room of the Takesaki Range Control Center (which is the launch control headquarters where all launch information is gathered,) the Block House (where direct instructions, control and monitoring are performed for the launch,) and the press center at the Takesaki Observation Deck (where all media representatives gather.) The displays have been used for many years, hence they are "historical clocks that have been used for the countdown and to monitor launches of rockets and satellites." For the "Daichi" (ALOS)/H-IIA F8 launch, new digital "countdown displays" will be introduced as a brother system of the conventional time displays thanks to the cooperation of CASIO Computer Co. Ltd. The new display units will be set up in the press center and on the rooftop of the Takesaki Observation Deck. The rooftop is an important location for launches because visitors and the media make observations from it. Therefore, the new countdown display will play an important role in allowing them to confirm the launch time not only with their ears but also visually." "Today’s weather here is fine with a temperature of 17 degrees Celsius. This morning in Tanegashima the weather was unseasonably windless and clear, but more and more clouds appeared in the sky in the afternoon. The Y-1 operations (operations on the day prior to the launch day) have been smoothly in progress, but we are concerned about the adverse weather forecast. For the rocket launch, the weather conditions are restricted (wind shouldn’t be too strong, no lightening should be forecast, etc.) Representatives of all operations had a meeting at the Range Control Center (RCC) to discuss if operations can be continued based on the established weather conditions. Such a decision-making meeting is called a "Go/No Go decision." Today, the Go decision was made at the meeting, thus operations are underway. All sorts of decisions are made at the RCC, then they are relayed to all on-site operators who are ready for the launch." "We had been preparing for the launch of the Advanced Earth Observing Satellite Daichi (ALOS) / H-IIA Launch Vehicle No. 8 (H-IIA F8) on January 19 (Thu,) but the launch has been delayed as a part of the onboard equipment needed replacing. Once it has lifted off, a launch vehicle autonomously calculates its position and speed using its onboard computer, and transmits such data to ground stations all over the world during the flight. Three transmitters are installed in the H-IIA F8, and one of them was found to be unstable. Therefore, JAXA decided to take it out today (the 18th) and replace it with a new one. As soon as the replacement is completed, we will resume operations. However, bad weather is unfortunately forecast for the next few days as a low pressure system with thunder and lightening is moving toward the launch site area. Thunder and lightening are the worst scenario for a launch vehicle and its operations. We must carefully examine the conditions before determining the new launch day. We will inform you of the new launch day on this Countdown page as soon as it is determined." "This is the second report on the 18th from Reporter S.A with the latest information from the Tanegashima Space Center. The onboard transmitter that was the cause of the launch delay, as reported in the previous report, has been replaced with a new one that was brought from a plant. After the replacement, we successfully verified radio frequency transmission and receiving by carrying out a test. We would like to inform you that the launch will be carried out no earlier than January 20 as we are still investigating the cause of the malfunction with the removed transmitter. The new launch day will be announced as soon as we determine it based on the operation and weather status." "As forecasted, it has been raining in Tanegashima since last night, and the wind has been getting stronger. This kind of weather is not unusual here, but the wind and rain remind us of a typhoon. Strong winds and heavy rain hampers us walking straight at the TNSC. Since this adverse weather is forecast to continue, it was decided today that January 21 is the earliest possible launch day. The new launch day will be announced two days prior to the launch." 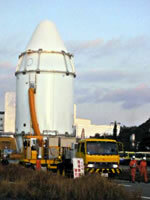 January 20: How is the Daichi (ALOS) waiting for the launch? "It is harsh weather here today with strong wind and rain. Frogs came out onto the streets during the evening while we were driving home as if they were the only ones who love this kind of weather. Today, I would like to report to you about the payload, Daichi (ALOS), as it waits for its launch. At the Tanegashima Space Center, the temperature was 12.4 degrees Celsius and the humidity was 88.5% at 11:00 a.m. today. This environment is not very favorable for the Daichi, which is sitting and waiting beneath the fairing on top of the launch vehicle. However, the inside of the fairing is controlled by an air conditioner. Clean and appropriately controlled air with a temperature between 15 and 30 degrees and humidity of 40 to 50% flows constantly into the fairing. The cleanliness standard is "Class several hundred." Thus the outside environment doesn't cause any problems. If the humidity is too high, condensation occurs when the temperature changes, and if it is too low, static electricity hinders us from handling pyrotechnics. The cleanliness is shown by the number of dust particles per cubic feet(*) of air. For example, outside air is about "Class one million", and the room environment is said to be "Class several hundred thousand." Now you can understand how clean the "Class several hundred" is. In addition, operators are working hard to check the satellite propellant tank pressure and temperature and to maintain the fully charged condition of the satellite onboard battery. (*) one cubic feet = about 28.3 liters"
The new launch day will be announced two days prior to the launch." "We are going to launch it from Tanegashima space center at 10:33 a.m. (Japan time) on January 23." "After the necessary equipment part was replaced and the weather forecast improved, the new launch date was decided. Countdown operations have resumed and the launch is set for January 23. We are carrying out the arming operation for the suspended Y-1 operation, which is the pyrotechnics connection for the launch vehicle." "The Daichi (ALOS)/H-IIA F8 live launch report will be broadcast with commentary by a JAXA employee from the studio in Tanegashima. The broadcast starts 50 minutes prior to the liftoff time." "The Daichi (ALOS) and the H-IIA F8 are ready in the Vehicle Assembly Building (VAB) at the TNSC for launch tomorrow morning. The weather conditions were carefully examined at 6:28 p.m. (Japan Standard Time, JST), and it has been determined that the H-IIA F8 with the Daichi (ALOS) onboard will be transferred from the VAB to the launch pad at 9:30 p.m. JST"
"The launch vehicle which is on top of the mobile launcher will travel about 500 meters from the VAB to the launch pad. It takes about 20 minutes. The overall height of the launch vehicle is about 53 meters with the Advanced Land Observing Satellite Daichi (ALOS) atop." "The launch vehicle has arrived at the launch pad. Connection operations between the launch vehicle and the pad facility are being carried out." "Connection operations between the launch vehicle and the pad facility are underway. Leakage is also being checked at the connection points." And thanks to Anik for the reminder. We'll aim to cover this the best we can. "All operations underway to be ready for the liftoff moment (= 10:33 a.m. (Japan time) on January 23)." "All operation aspects, namely the readiness of the launch vehicle, the payload, the launch facility and tracking systems, and weather conditions have been confirmed, and we are go for propellant loading operations. Preparation for the loading will soon start." And now official launch date is February, 20th. One-hour launch window start at 21:00 UT. Launch period is February, 20th to February, 27th. 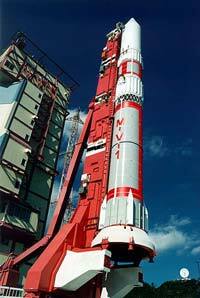 Launch of H2-A with MTSAT-2 was reschedulded. Official launch date is February, 18th. One-hour and 18 minutes launch window start at 06:26 UT. Launch period is February, 18th to February, 28th. A computer glitch partially shut down a Japanese satellite that launched earlier last week, a space agency spokesman has said. In the latest problem with Japan's star-crossed space programme, the four-ton Advanced Land Observation Satellite reported an error in the system that processes the observation data it collected, Japan Space and Exploration Agency spokesman Tatsuo Oshima said. The satellite was switched into "safe mode" while agency officials reviewed the error-detection data, Oshima said. Most recently, the space agency announced last month it would delay until 2010 the return of a problem-plagued probe sent to collect samples from an asteroid because a thruster problem put the vehicle into an unexpected spin. The Hayabusa probe was originally scheduled to return to Earth in June 2007. "Rocket System Corporation (RSC)'s second launch mission will be performed on this coming February using H-IIA launch vehicle No.9 (H-IIA F9). 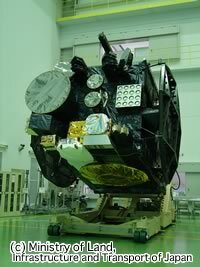 The satellite to be lofted by H-IIA F9 is the Multi-functional Transport Satellite 2 (MTSAT-2) owned Japanese authorities, the Civil Aviation Bureau (JCAB) and the Japan Meteorological Agency (JMA), the Ministry of Land, Infrastructure and Transport of Japan (MLIT). RSC signed a launch contract with JCAB and JMA in February 2003 to orbit the MTSAT-2 satellite into geosynchronous transfer orbit using an H-IIA launch vehicle. A liftoff mass of MTSAT-2 will be approximately 4.65 tons. 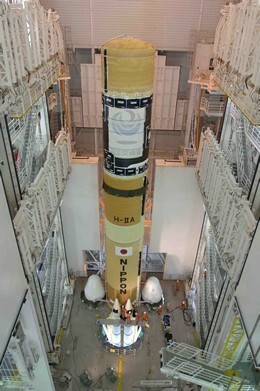 This means the satellite is the heaviest ever launched in Japan. In order to loft such a massive satellite, RSC prepares H2A2024 type of H-IIA with four solid strap-on boosters (SSBs). Moreover, to maximize the launch capability, RSC adopts the long-nozzle LE-7A engine and a flight sequence of all SSBs' simultaneous burning. H-IIA F9 was carried to the Tanegashima Space Center on November 23, 2005. Then, at the Vehicle Assembly Building (VAB), RSC carried out on schedule the vehicle assembly operations such as mating the 1st stage with the 2nd stage, Solid Rocket Boosters (SRB-As) and SSBs (see photo 1). After that, the wet dress rehearsal (cryogenic test) was operated on December 20, 2005 to verify all functions of the launch vehicle, ground equipments and facilities, fueling liquid oxygen/hydrogen into the core booster, and resulted in success (see photo 2). 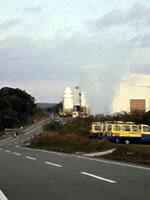 The MTSAT-2 satellite, meanwhile, was transported to the No.2 Spacecraft Test and Assembly Building (STA2) on November 19, 2005 (see photo 3), and final assembly operations and verifications were operated. Then, on January 12, 2006, the satellite was transported to the Spacecraft and Fairing Assembly Building (SFA) for propellant loading (see photo 4). As the result of today's successful launch of JAXA's ALOS mission, operations for our MTSAT-2 launch mission is entering the final phase."